The Expendables 3 is a 2014 action movie from director Patrick Hughes. It is the second sequel to the 2010 film, The Expendables, and the third movie in the The Expendables film franchise. In The Expendables 3, team leader, Barney Ross, replaces his old teammates with some new blood for a showdown against a former friend turned arms dealer. 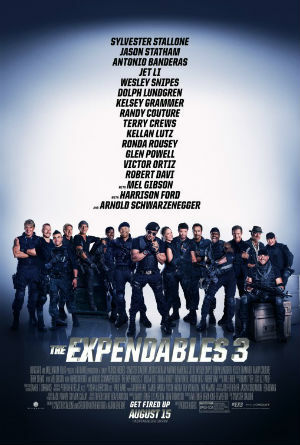 The Expendables 3 opens with the Expendables: Barney Ross (Sylvester Stallone) the leader; his right-hand man, Lee Christmas (Jason Statham); Gunner Jensen (Dolph Lundgren); Toll Road (Randy Couture); and Hale Caesar (Terry Crews), on a new mission. They seek to rescue Doc (Wesley Snipes), one of the original Expendables. With Doc in tow, the Expendables head to Mogadishu, Somalia to capture billionaire arms dealer, Victor Minns. However, Minns turns out to really be Conrad Stonebanks (Mel Gibson), who co-founded the Expendables before going rogue. After the Expendables' mission goes horrible wrong, Barney dismisses his current team. When he faces Stonebanks again, Ross plans on having a younger team that is also not connected to him in any personal or emotional way. But are the new Expendables: Thorn (Glen Powell), Luna (Ronda Rousey), Marlito (Victor Ortiz), and John Smilee (Kellan Lutz), really ready to take on an Expendables mission? The Expendables 3 is full of old relic-type actors from the 1980s and 90s – stars who dominated the movie box office and one television star. The story toys with the idea that the old folks must make way for the new stars, but ultimately, it only plays with such a notion. Honestly, I want to see Sylvester Stallone, Mel Gibson, Wesley Snipes, Harrison Ford, and Arnold Schwarzenegger more than I want to see Ronda Rousey and Kellan Lutz (nothing against them). I can't quite express how much I enjoyed seeing Kelsey Grammer (as Bonaparte), an actor about whom I have always had mixed feelings, and Harrison Ford (as Max Drummer). Ford is really showing his seven decades, but he's still cool. The Expendables 3 is at its best when it showed the old dogs in action, which is what made the original film such a treat. So, if there is a fourth film in this franchise, I want more aged beef and less fresh meat. Salt Lake City Comic Con Can Stay a "Comic Con"
Fantagraphics Books Got Next "Kramers Ergot"
Review: Denzel Washington Takes "Flight"